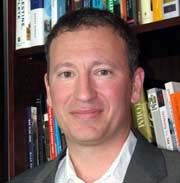 Marc Lynch is Associate Professor of Political Science at George Washington University and the Elliott School of International Affairs. He received his Ph.D. in 1997 from Cornell University and his BA from Duke University in 1990. He works on international politics, with a specialty on the Middle East. His current research interests focus on the relationship between new media technologies and Islamist movements, public diplomacy, and Arab public opinion. He also runs the popular Middle East politics blog, Abu Aardvark. He is the author of State Interests and Public Spheres: The International Politics of Jordan's Identity, and Voices of the New Arab Public: Iraq, al-Jazeera, and Middle East Politics Today.